LinkedIn is well known for allowing you to stay in touch with professionals in your field and tracking your work history and accomplishments - but it's also a surprisingly expansive social media site. Many professionals only use their LinkedIn profiles for "connection collection" without taking advantage of all the opportunities it provides for link building. Search engines view LinkedIn as a very credible site, so its pages can be indexed highly in search results. 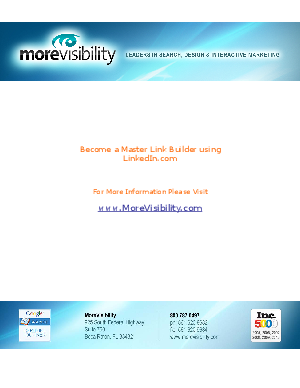 As such, LinkedIn holds substantial traffic potential for your link building efforts.